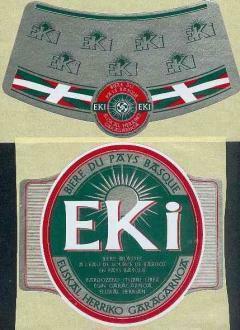 Beer from Basque country (France / Spain). I had this beer in the bar called Kostaldea in Guéthary. Yellow, not much head retention, can feel a hint of hop and light body. Nice refreshing beer to drink in front of the beach on a hot summer days. Maltier than I thought for a French lager, sorry, Basque lager…. 330ml bottle at Ur Onea, Bidart. Pours clear pale golden yellow with a thin white head. Aromas of corn, cereal grains, light lemon. Taste is more of the same, thin, light astringent finish. OK. Originally rated October 2005. Sampled from their green 330mL bottle, brought back by my girlfriend from her European trip. Best before date is 01/10/06. Pours a golden-blonde colour with a fizzy white medium head. Retention is low and some minimal lace is left, here and there. Nice light tiny bubble carbonation. Skunk nose... of course, with some grainy malt, but very mild. The taste is quite light, but yet, refreshing. Some hop, but not too bitter. Some sweetness, but not much. Grain comes out in the aftertaste. No offensive metallic or other garbage in the taste. Just a decent refreshing pilsner-style lager (alternative to Heineken, but lighter tasting). bottle, clear golden, white head. aroma, hoppy, pale malts, light caramel and bread. flavors, pale malts, hoppy metallic palate, light watery caramel malts mouthfeel and finish. Overall finish and profile keeps a touch of malts followed by light bitterness and citrus. Draught in Southerne part of France. Yellow colour with white head. Plente of malt - quite unusual for a pale lager. the carbonation makes the beer, otherwise avrage. light malt and a touch of hops round out the flavor. the basque seem to do most things better than beer. OK, although some don’t like the fact I found it amber, the fact is I had it in Bilbao, just in front of the Cathedral. The flavour was quite malty, if memory doens’t fails me after more than one year and a half. Quite foamy, the bar tender was from the Ecuador, and a Spanish lady tried to pay him with MExican pesos, which look like Euros in smaller size. I had a chorizo tapa with it. It’s not the only "gold" beer that looks amber, I’m sorry if I don’t call blonde a beer that looks like earwax.